Some people struggle with honesty more than others. This struggle usually results from significant feelings of instability. Even after finding consistency, the struggle often returns when routines get rattled. With these people, learning how to earn trust is essential. A great way to understand how to earn trust comes from how we can teach it to our children. My husband and I have often told our boys that they determine how much we trust them; they get to decide the level of trust that exists. After explaining that how much we trust them is up to them, we provided practical ways to earn trust. Be faithful with small things. Small things done consistently over time add up to make a big difference. For our boys, this means being responsible with their possessions and keeping their rooms clean. Do what’s right even when no one is looking. We remind them that someone (God) always sees and that while he may not get caught, they don’t get away with it. We explain that this is the basis of their character. Check your attitude. Eye rolls. Hand flings. Voice tone. All of these speak toward lack of receptiveness. Being receptive — being teachable — opens your life up to blessings rather than undesirable consequences. Don’t get defensive. Fully listen first, which earns you the right to be heard. Defensiveness only alerts to the presence of dishonesty even more. Stop excuses. Think first, then check your motives. Before giving excuses, ask yourself if you’re trying to hide something. Own up to mistakes. Be honest. Seems obvious, but simply deciding to be truthful in attitude, actions & words goes a long way in your efforts to earn trust. Think of others. Putting others first often not only keeps you out of a lot of trouble, but it shows that you’re striving to not be selfish. Unselfishness goes a long way to help earn trust because dishonestly usually has selfish motives. Be dependable. Do what you say you’re going to do when you say you’re going to do it. Keep your commitments. There’s no quitting a team when the coach is mean. Young people can often serve as examples to adults in this area. Admit mistakes, learn from them, and move on. Get out how you’re feeling. Process your feelings. Deal with them before they direct you. Don’t let feelings determine actions. Don’t get hung up on the mistakes either. Move on. Stay positive. So many people are negative, mean and selfish. That doesn’t mean you have to be. Don’t let your circumstances determine your reality. Stay positive and focus on what you know is right. This approach building trust works for any relationship, not just when teenagers want to earn trust with parents. Actually, the above habits are essential for anyone wanting a reputation of solid character. This entry was posted in Struggle, Trust and tagged action, actions, blessing, blessings, building trust, character, commitment, commitments, confidence, consistency, faith, focus, habit, habits, honest, learning, listen, mistakes, move, practical ways, process, reflection, relationships, reputation, routine, Ruth, serve, significant, struggle, teachable, teenager, time, trouble, trust, truth, victory, words, work by admin. Bookmark the permalink. Accept Jesus' righteousness as your own. He is the Truth and can be honest when we cannot. Reading Grace: The Power to Change by James Richards. Wow. I was just telling my oldest I wish I had read this years ago and I would have been a better parent. He seemed shocked that I didn't feel like a good parent, so that made me feel better. 🙂 It's easier to be honest when we feel completely loved. That's the kind of love we have in the Lord. Excellent list for building trust. The security of a relationship built on trust and one where grace is freely given makes a person want to be brave. I know these relationships give me confidence to do more, to try new things, and to push through fear. The power of a trusting relationship is huge, even more so when that trust is based on God's truth. Yes, it makes sense. And I wish we had been less reactive, especially in the beginning. We're certainly much more proactive and a lot less reactive than we used to be, but there are those occasional moments… Our goal is for him to think first for sure. But, well, he is 12, and he is a boy. But we know that he does not have to be just like everyone else. We don't have to accept that this is just the way things are. We know the power of God to change a life, and we believe that building trust is a big part of that change. I think it helps too if when you have done something wrong that you attempt to make amends if possible. I think that builds trust if the other person knows if you mess up then you are going to do all you can to make it right. It also is good to clarify expectations because sometimes people's trust wanes because of unmet expectations even if they were not known. Two VERY good points, Mark. When either of my kids messes up – breaks trust – we talk about it and say, "Admit it. Learn from it. Move on." That helps them not be so hard on themselves after they've gotten in trouble. Also, the idea of clarifying expectations is a good one. And my boys illustrate how differently that needs done from one person to the next. My youngest needs a lot of help with that. My oldest is good at asking questions to clarify. We are teaching them skills they can use as adults. And every time we go through a talk involving making amends and/or clarifying expectations, I learn something about my own needs in those areas too. Again, great points! Thanks, Renee. And thank you for sharing this very tough example that you are living out. It's definitely a perfect one to talk about how to rebuild trust. We actually tell our kids that how much we trust them is up to them. Sure, we can chose whether or not to trust them, and our own issues are at play there. But basically, increasing trust is really in their hands based on the consistency of their attitudes, actions and words. And when they really mess up, they sometimes do have to go out of their way to find trust-building opportunities. Of course, there's grace at work in their too. Without grace, I am not sure we could survive this tough job we have as parents! You are, I am certain, living out the truth of this with your son. Great post again Kari. Thanks for sharing your life to help others. I think Trust is a 2 way street. Today so many people tell kids not to do this or that and then violate the rules themselves and it gives kids the wrong idea. And when they see their parents model trust in God, in each other, and in them, it helps them to understand what trust is all about and why it is so important. Am sharing this with my daughter who is raising a 14 yr old as of yesterday. Thanks, Mary. Yes, it is a two-way street. We must set examples as parents for our kids to follow. I read somewhere that the biggest negative influence on a child is not their peers or television or video games. The biggest negative influence can come from parents whose public and private lives contradict each other, who say one thing and do another. Lord help is to not be that influence in our kids and grandkids lives! Kari, I completely agree with every point. I especially liked where you said, "Get out how you’re feeling, and let’s process those feelings together. But don’t let your feelings determine your actions." Kids who have bottled up their feelings for survival have a very difficult time even identifying them. Kudos for working to help him realize and address his emotions before acting out on them. Here's the root of this for me, Deb. Growing up, I was never taught how to deal with feelings. As a result, feelings ruled my life for way too long. They determined by every attitude, thought, action and word. As I gradually realized this and am still fighting today to counteract this, I am passionate about teaching my boys how to express their feelings. I guess it's basically taking their thoughts captive. I did not want them to struggle with feelings their whole lives like I did. They'll have enough other struggles for sure. Part of the challenge, Kari (great post, by the way!!!! ), is separating what is truly a feeling from what is a thought; that alone is an educational process. An example: Someone almost causes a traffic accident involving their car and mine. The key word in the previous sentence – almost. It didn't happen. OK, but in that situation I go through a wash of feelings, one of them being anger. The anger? Driven by fear of what almost did happen. Relief (pleasure) that it didn't happen. Great point, Rick! Have feelings, acknowledge & deal with them honestly, and use them as gauges for progressing & maturing. But thoughts, though partnering at times, are different animals. They need captured & put up against God’s Word. Both can have power over us, but we have more choice with thoughts, at least letting them linger. Love the thought "you determine the level of trust." You give some practical ways to build/earn trust. Faithful, dependable, honest: measure your life by those three standards and you're likely to be deemed trustworthy as well. And we need to be consistent in doing so in order to maintain that trust. It's not a one-time deal. Being a trusting person is so essential. Another way to build trust is by keeping our word, being a person who does what they say they are going to do. Great post, Kari! Yes, it is essential. 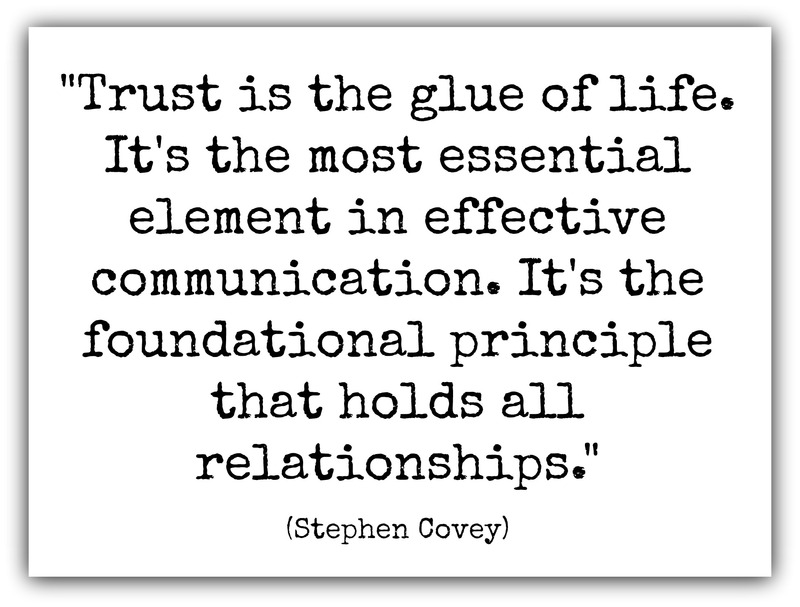 Trust is a foundational principle for strong relationships. Thanks, Dan. Letting go of pride is a huge trust builder. It says that you value relationship over self. Great point, David. My mother used to always harp on your first point – performing well in the small things. I can still hear her say "small decisions, small decisions, small decisions." It was so annoying as a teenager, but she was right. He who is faithful in a little thing will be entrusted with much. As I age, I discover that those "annoying" things my mom said when I was a kid were spot on for God's direction in my life. The small things in life add up to big things over time. Getting that straight in our thinking can really transform our lives. It has mine for sure. What I especially agree with and struggle to do is to earn my privilege to talk by first listening fully when someone talks to me. I think we all do to some degree. Even when we are honest and tell the truth; if we cannot do it in love and with gentleness, I think it is much better to zip the lip!! To many breaks others even further by telling them truth in such a way that it is of no help to the person struggling with an issue. Great post! Glad I found your blog. So glad you found my blog too, Mia! I struggle a lot with listening fully first too, which is probably why it's a big point to get across to my son. It's definitely a habit to continually work on. How many relationships would find tremendous healing if the individuals in them listened more?